Among the many catalogues and reproduction images Rodney Pople brought back to Australia from his first visit to Venice in 1988 was a postcard of Tintoretto’s Scuola Grande at San Rocco. The juxtapositions inherent to Venice itself – between reality and fiction, strength and fragility – are also inherent to the works here. An appreciation of Venice involves a suspension of disbelief, its fragile façade threatened by rising tourist numbers and water levels. Just as Venice provides a picturesque backdrop to visitors’ romantic illusions of life, the postcard image of San Rocco forms a backdrop to this series of apparently random symbols of society’s dreams and fears. Though Pople’s work evades direct reference to current affairs, it is very much of its time: his evocation of cultural slippage have a deep resonance with the global challenges confronting society today. 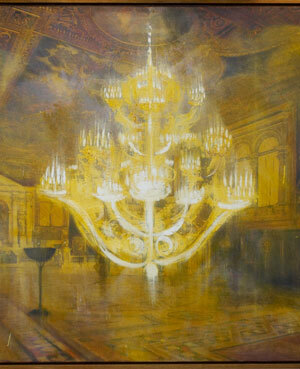 The oversized chandelier symbolises Venice but also the delicacy of its, and humankind’s, very existence. Rodney Pople was born in Launceston, Tasmania in 1952 and lives in Sydney. He qualified at the Tasmanian School of Art before undertaking postgraduate studies at London’s Slade School of Art and the New York Studio School. His work is in state, corporate and private collections and is represented by Australian Galleries in Sydney and Melbourne.